This Demonstration describes the start-up of Poiseuille flow in a Newtonian fluid. 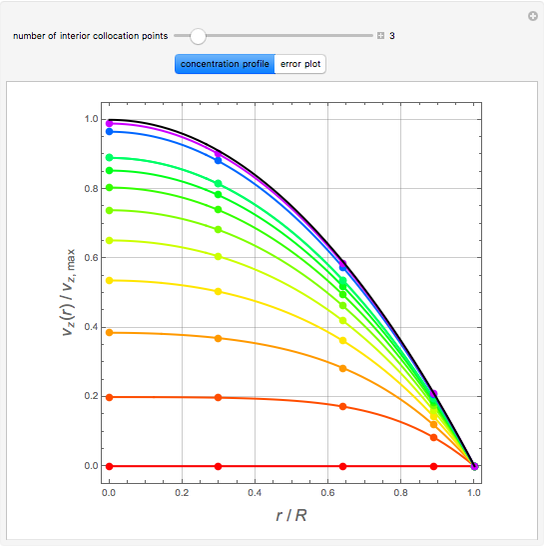 The velocity is determined using either Mathematica's built-in function NDSolve (solid colored curves) or orthogonal collocation (colored dots). The Demonstration plots the dimensionless velocity profile versus the dimensionless radial position at various times ( , , , , , , , , and ). You can change the number and location of interior points used in the orthogonal collocation method. The collocation points are the roots of the Jacobi polynomials. The black curve shows the typical parabolic velocity profile obtained for Poiseuille flow at steady state. To quantify the accuracy of the collocation method, we compute the Euclidean norm of the error for collocation points, given by where is the solution obtained using NDSolve. 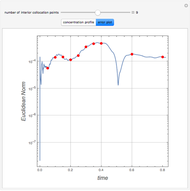 This error is plotted as a function of time on the error plot. The red dots denote the times used in velocity versus radial position plots. 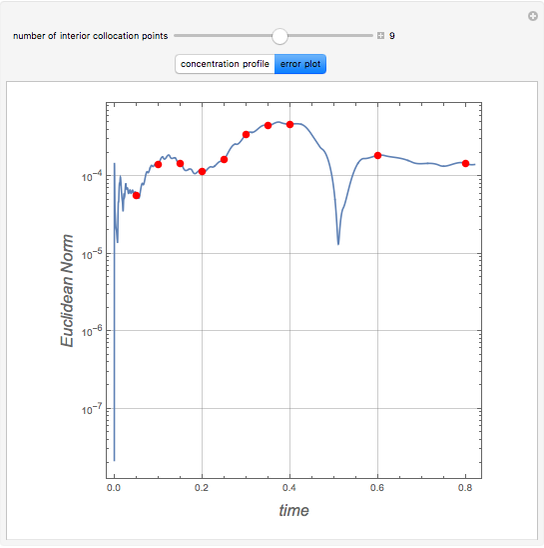 As the number of collocation points is increased, the Euclidean norm in the error plot is reduced. For and , . where the dimensionless time is , the dimensionless radial position is , and the dimensionless velocity is . The boundary and initial conditions are: , , and . The kinematic viscosity is where is the fluid's viscosity and its density, the radius of the pipe is , and is the velocity at the center of the pipe at steady state. Housam Binous and Brian G. Higgins "Start-up of Poiseuille Flow in a Newtonian Fluid"